Remember Representative Democracy? Those Were The Days! While we continue to teach the idea of representative democracy to our students, it’s a concept that seems to be completely lost on many of the actual people we send to Albany to represent us. Case in point: Senator Ken LaValle. As we know, statewide polls overwhelmingly showed opposition to the Governor’s plan. And while polls in-and-of themselves aren’t enough, he had meetings with constituents who explained and provided evidence why he should oppose the proposed reforms. Nonetheless, LaValle voted with his cronies instead of his constituents. Newly appointed, but so far un-indicted (at least as of this posting) Senate Majority Leader Flanagan introduced a bill to make the tax cap permanent. Now, the fact is, polls do show strong support among most groups for keeping the tax cap. Of course, during the years it’s been in place inflation has been low and school districts have used reserves to help minimize the impact, so taxpayers most likely don’t have a good understanding of the long-term impact it may have. This is certainly a case where there may be more to the story than just poll numbers, so of course you’d expect REPRESENTATIVES like Senator LaValle to reach out to the residents of his district to find out what they think, right? Well the good Senator did reach out to his people. He sent out an email touting the tax cap along with a link to click IF YOU SUPPORT IT. Not a questionnaire asking what you think and why, not a mechanism to solicit feedback. Just a simple message – if you support the tax cap I wan’t to hear from you, and if you don’t, I don’t care. Well, since there are a lot of people who very much oppose making the tax cap permanent, he needs to know that. 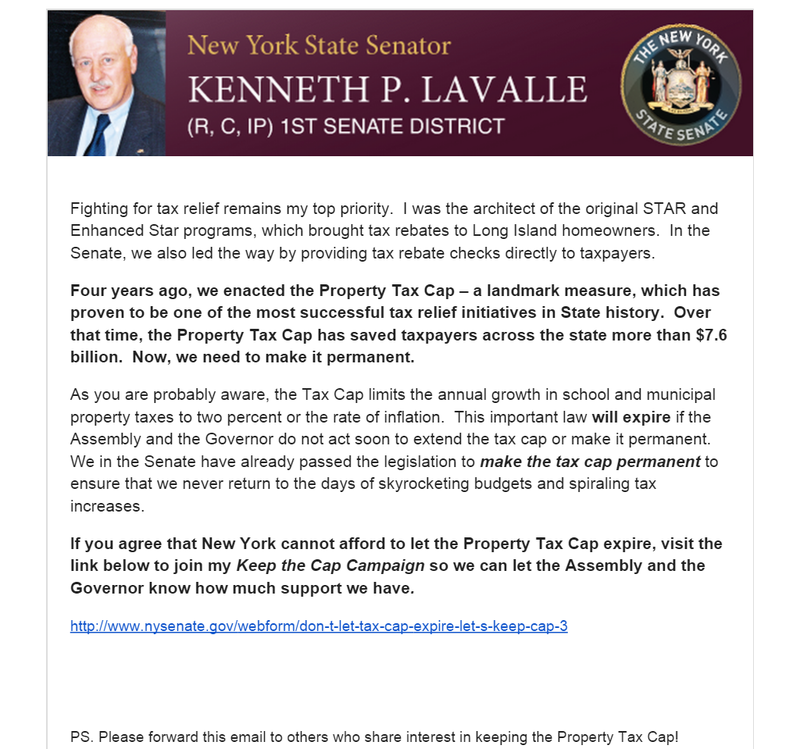 Please call or write Senator LaValle to let him know that keeping spending to an arbitrarily low number that is less than or equal to the rate of inflation is not sustainable, and will cause many school districts to eventually become insolvent. This is not good law and he should not support it. We previously mentioned a senate bill introduced by John Flanagan that is ostensibly designed to undo some of the April 1st education law, but is actually useless, distracting, and potentially damaging. Another bill, A7303, being promoted by Assembly Education Committee Chairwoman Cathy Nolan, goes a bit further, but does it go far enough? It pushes the deadline for districts to revise their APPR plans to the following year. But critics of the bill, such as this parent and blogger, point out that the bill does nothing to actually reduce testing, and doesn’t fix, but simply pushes off, the use of VAM junk science to rate teachers. On the one hand, pushing the deadline back a year give more time to work toward the goal of overturning the whole thing. However, it may also be that once another year has passed, what has been put into place here will become the new normal and the fight will have shifted to staving off the next, new, even worse thing. Getting back to newly anointed appointed State Senate Majority Leader John Flanagan, a bill now in front of the Senate would make the tax cap permanent. Unfortunately, polls show that a majority of New Yorkers favor the tax cap. Is this because they haven’t yet seen the incredibly corrosive damage that this will do to the public school system once it’s been in place for a few years (especially if inflation heats up in the future)? Or do they just not care? Probably a combination of the two.